After identifying a source of problematic reads and re-running featureCounts using the read2pos flag, the tests still fail. This anaysis explores the remaining bugs lurking in the sequence processsing pipeline. This problem affects 13 out of the 16772 total genes (0.08%). For these problem genes, the median number of affected samples is 1 and the max number of affected samples is 2. For gene ENSG00000143294, the sample NA19098.r3.E09 was assigned 33 reads but 0 molecules. What happened? Note that NA19098.r3.E09 is not a high quality single cell, so this particular error has no effect on our downstream results. It is. 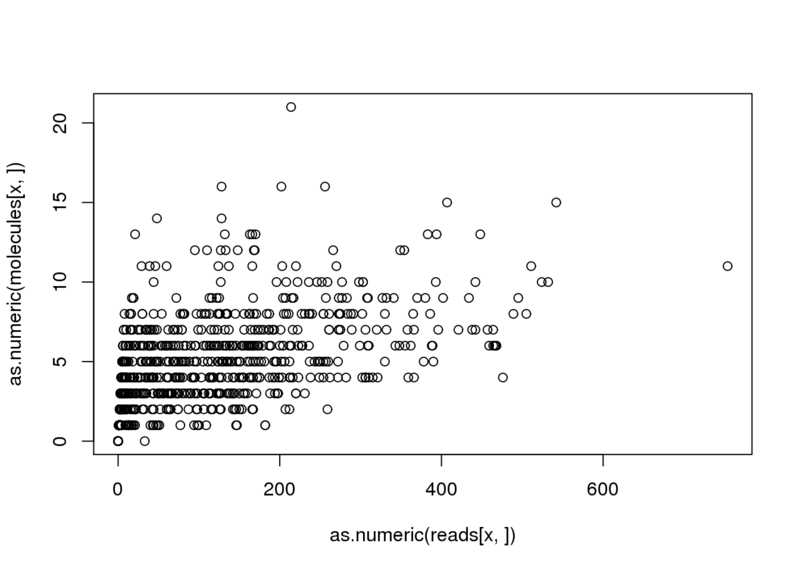 The featureCounts results corroborate that 33 reads are mapped to this sample but zero molecules. Therefore the problem is upstream of my Python script to gather the gene counts. Next I inspect the featureCounts assigment results (flag -R) to corroborate the output file results. Because all the lanes failed similarly, I’ll focus on the lane with only 9 reads for simplicity. All 9 reads have the same UMI sequence. Now I want to know if featureCounts reports having seen any of these reads, but does not assign them for some reason (e.g. ambiguity, mapping to more than one feature). featureCounts has no record of having seen any of these reads and then not assigning them. This suggests the problem is upstream. Are any of these reads present in the bam file passed to featureCounts? These are the output files from the step to remove duplicate reads (i.e. convert reads to molecules). This was strange that none of these reads were maintained in the molecules file. I took a closer look at the data directory and realized there was still a bam-dedup-umi directory. I had used that when I was initially testing dedup_umi.py from UMI-tools. Checking the dates, I realized that these files were more recent! This is not good! The bam files in bam-dedup-umi are more recent than those in bam-rmdup-umi. It is the files that are in bam-rmdup-umi that get passed to featureCounts. Thus it appears I am passing results from umitools rmdup instead of dedup_umi.py. The creation of the files in bam-dedup-umi on January 11th is consistent with my commit history. I implemented UMI-tools dedup_umi.py in commit 2e024cd on January 12th. I know that the results from these two different methods are not drastically different because I compared results from the two, but perhaps this is what is causing these slight discrepancies. Looking in bam-dedup-umi, it does contain one of the sequences in the molecule file. Searching this sequence with BLAT, it does map to ENSG00000143294. My plan is to delete all the de-duplicated files and re-run the de-duplication and gene counting steps. If this doesn’t fix the problem, it will at least make it easier to investigate and diagnose the exact problem.